EPUB is a widely used format for eBooks and many e-readers does not accept all book formats such as PDF. Almost all eBook readers accept EPUB and Today I'm going to write a Tutorial on How to convert PDF to EPUB. By doing this you can easily convert your PDF eBooks to EPUB and read on your favorite eBook reading device. This post is especially for Apple iPad users, iPad only accepts EPUB eBooks, so many iPad users face this problem. In this post I'll explain different methods of converting PDF to EPUB. I love reading books on my tablet, as I work in merchant navy, I cannot carry hard copy books with me all the time, here is where ebooks comes in for rescue. With eBooks, one can easily carry thousands of books in their eBook readers or tablets. Many of my eBooks are in PDF format and some of my favorite eBook reading apps only recognize EPUB books, So what to do? Just read the post and you'll come to know. PDF or Portable Document Format is a file format for sending electronic documents in a manner independent of application software, hardware and operating systems. This is a globally recognized format for electronic documents and does not require any special paid programs to access. One can easily download PDF readers Free. EPUB or Electronic Publication is a format for eBooks. EPUB is a free and open eBook standard by the International Digital Publishing Forum (IDPF). EPUB is an Open Publication structure eBook format and most of the eBooks come in this format. 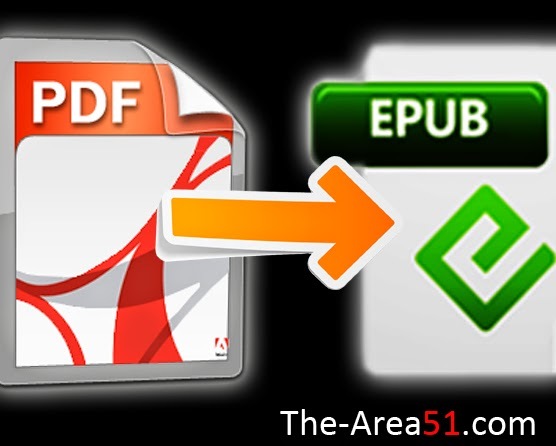 In this post I will explain three methods of converting PDF to EPUB. I will explain the Online method, the offline method and conversion using mobile apps. so lets begin. By online methods I mean online websites where you can upload your PDF file and convert it to EPUB without wasting time. This is a quick method, all you have to do is go to such a site, upload your PDF and click on convert button and Done. Below are some sites which have online EPUB converters for Free. ebook.online-convert.com - Quick and easy conversion, Quick Download. 2epub.com - Upload, Convert and Download Quick. zamzar.com - Upload, Convert and receive conversion via email. So these are some of the best websites for online PDF to EPUB conversion. I would recommend the first two websites as they are quick and you can easily download the EPUB file. The third website will send the converted file to your email and you have to login to your email and download the file. A Quick Example of using these online tools. Though these online tools are self explanatory and very easy to use but still I will show the steps to use for one of the above tools. For the steps I'm using the first online tool website. Step 1: Choose Files and you can either browse your computer and choose the PDF file, You can choose PDF with URL and you can also choose files from Dropbox. Step 2: Optional Settings. Here if you want to change some particular thing then you can do it, this is optional part and if you don't know anything about it then just skip it. Step 3: Convert. Wait till it converts your PDF to EPUB. Download the EPUB file once it finished conversion. So in the above section I explained how one can convert PDF to EPUB using free online tools but what to do if you are out of network range or if you don't have a working internet connection. Don't worry, There are many offline conversion methods which I will list in this section. Calibre eBook manager is a free software which can help you convert your PDF books to EPUB. Calibre can also convert to a large number of formats and supports all major book formats. This software is widely used by Apple users and is available for both Windows, Mac and Linux users. Calibre can convert from a huge number of formats to huge number of formats. Calibre is the solution of your all ebook problems and is the best offline free software for ebook conversion. With calibre you can not only convert PDF to EPUB but can also convert from many other formats. The above software are free and you can download them by clicking the above links. If you read ebooks on your Android smartphone or tablet then you can also install free apps for converting PDF to EPUB. below are some best apps for this purpose, Sorry to say but there are no apps for iOS and other platforms. If you are Android user then you're in luck! Android apps are great way to convert PDF to EPUB on the go. you can install them on your phone or tablet and keep converting PDFs to EPUB wherever you want. So this was my detailed post about converting PDF to EPUB, I hope you guys enjoyed my post and I hope it helped you. I would recommend Calibre eBook management software as it is a complete ebook solution and can do a lot more than just converting. For quick use Online tools are great and time saving. If you have doubts then leave comment below and please share this post.